I was watching the Lorax the other day, and just loved how everything towers over the characters. 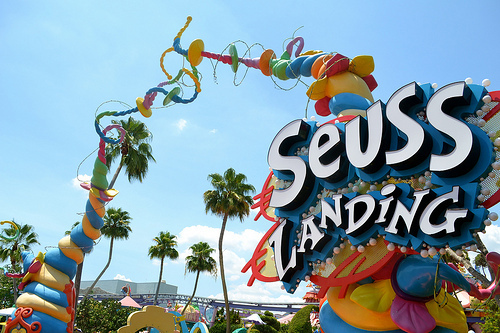 As though everything is a leaning tower of madness, waiting to topple down. Someone combined acid and rainbows in their cereal the morning they designed this. 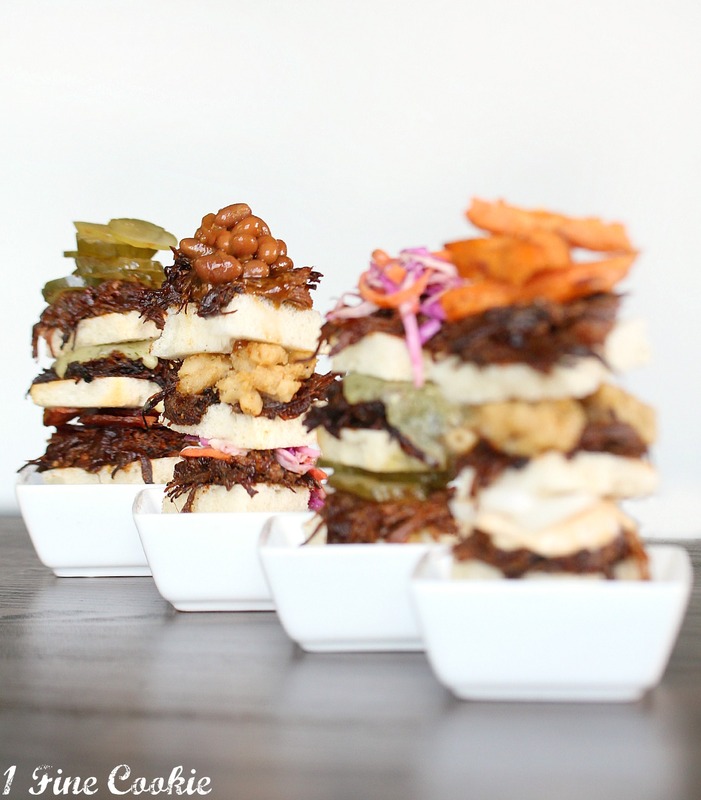 Rather than trees and buildings, why not make a tower of food? Fortunately, I received a jar of Musselman’s Apple Butter in the mail. Oh the ideas! I decided to use it to add a little kick to my pulled pork recipe. 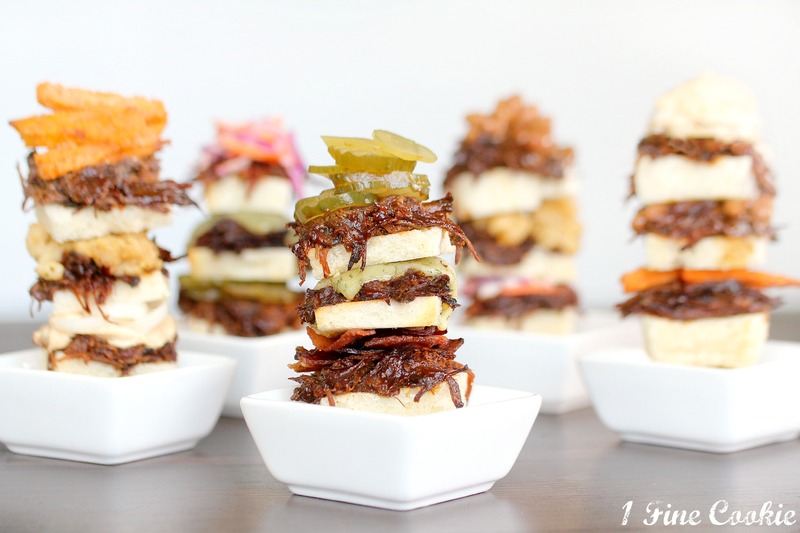 Rather than make the usual sliders or sandwiches, I created tall towers. You’ll see. Oh, and you can win a jar or Musselman’s Apple Butter, recipe cards and this matching multi-purpose bowl. Keep reading to find out how to enter. You do not need to make a barbecue sauce if you are short on time, but if you do you will need these ingredients. If you prefer to skip, then you will only need your favorite barbecue sauce and apple Butter. *If you plan on making your bbq sauce, between the pork and the sauce you will want a couple of jars depending on how strong you prefer the apple butter flavor to show through in your pulled pork. Start by coating your pork with the dry and wet rub the night before you want to cook it. Cover with a generous amount of apple butter. Mix dry mustard, paprika, chili powder, garlic salt, and black pepper together. 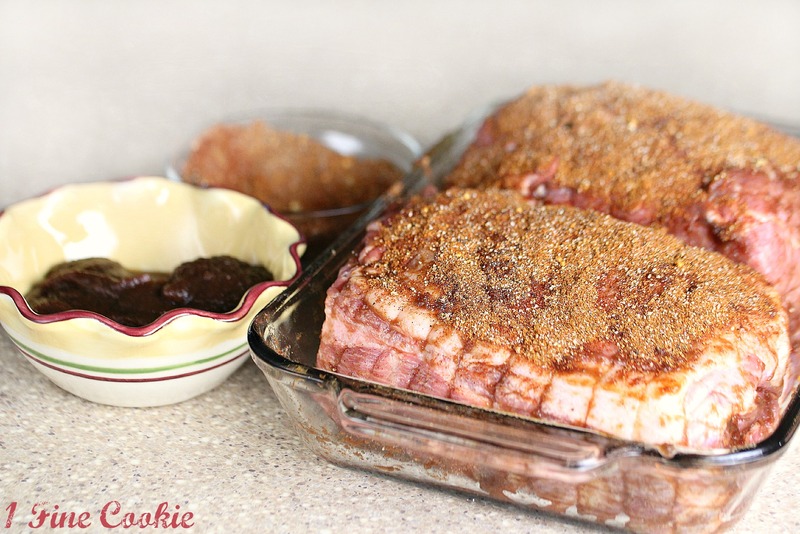 Cover all sides of the pork with the dry rub, sealing in the apple butter. As you can see from the photo, I doubled my recipe. Feel free to double the recipe (or more) if you plan on serving a large crowd. Place pork in plastic storage bags and sit in fridge over night. If you have a smoker, then you can cook your pork on that. 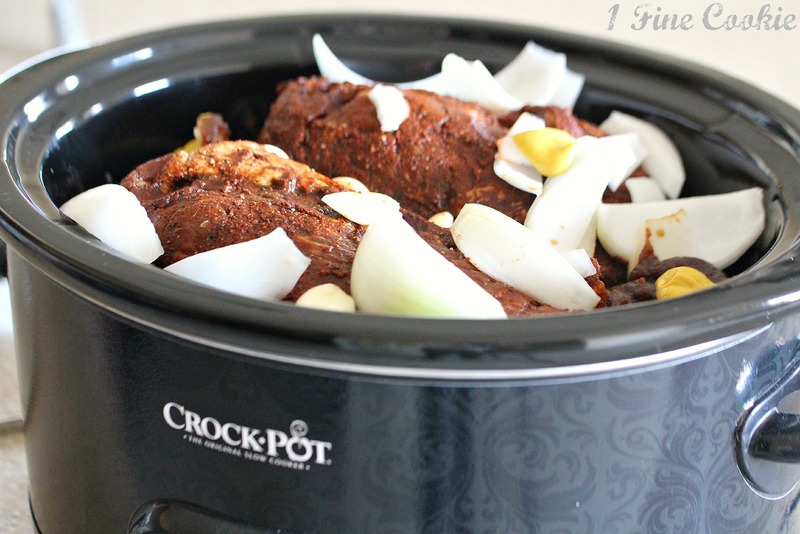 Many of us are not luck enough, so a slow cooker can be used as a slow cooking method. I used liquid smoke in my recipe. Again, if you have a smoker you need not worry about that either. Place cut onions, garlic cloves (amount to your liking), liquid smoke, apple cider vinegar, mustard, Worcestershire sauce, and apple butter into the slow cooker. I added about 2-3 cups of apple butter. The more you use, the better that the flavor comes through the meat so don’t skimp out! Place pork on top and set cooker on lowest heat setting. I set mine to 10 hours low. Between 8-10 hours remove slow cooker lid. Pour out meat drippings, and use a fork to pull fat from pork. Shred up meat with fork and set aside in airtight container. Place meat drippings in fridge. Once fat has separated, remove with a spoon. See all of that light brown stuff at the bottom? Those are meat particles. Sedimentary, my dear Watson. Sedimentary. Pour meat drippings through a strainer to remove particles. The measurements in the ingredient list for the barbecue sauce above is for every 1 cup of meat drippings. I suggest using all of the meat drippings you have. Stock up on excess barbecue sauce for later. Don’t waste those drippings! 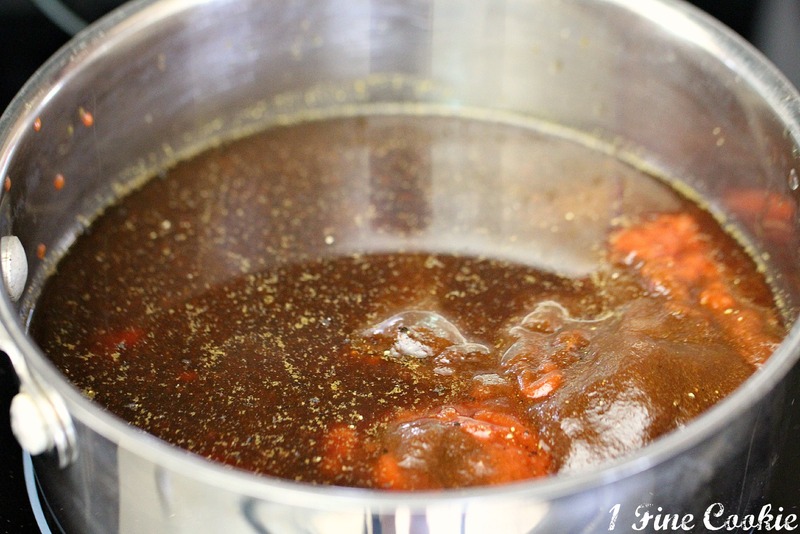 Cook meat drippings, water, apple butter, molasses, ketchup, liquid smoke, hot sauce, pepper, and Worcestershire sauce on low in a sauce pan. 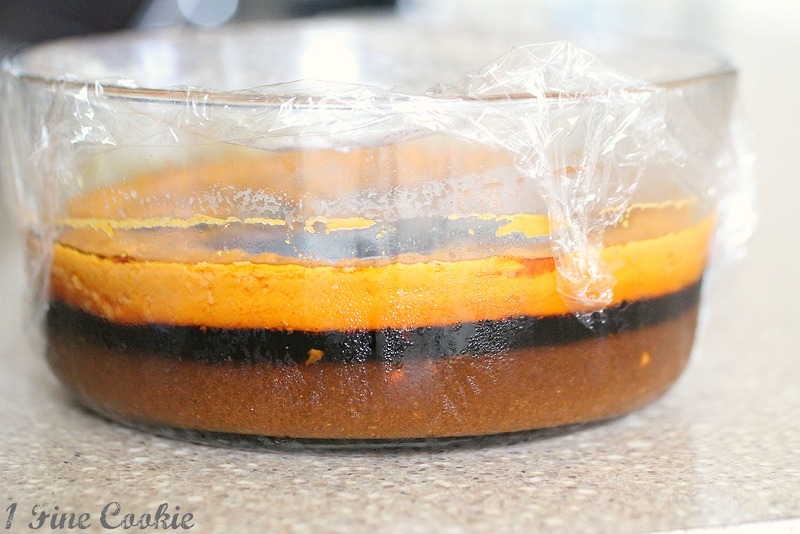 Mix often, so that the sauce does not burn on bottom. Cook until it reaches desired thickness. Mine usually ranges between 30-50 minutes. Cool a bit and mix some in with pulled pork. Store the rest in a jar. To create the towers, cut out squares of freshly baked bread. 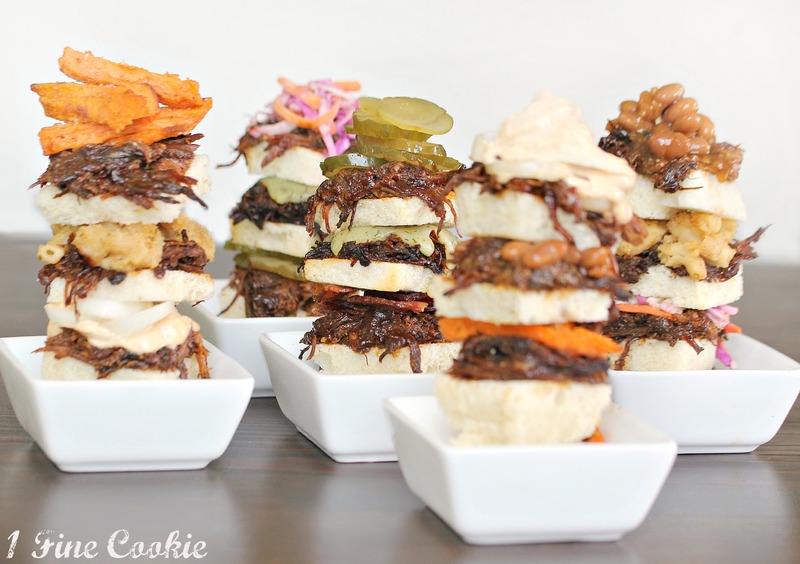 Place a little pulled pork on each, then add some of your favorite condiments or sides. ****If you are considering posting up photos or ideas from this or any other posts I am truly happy that you are excited and find my recipes interesting enough to share with others. Please see copyright standards in the footer (bottom) AND follow them!!!! In other words, 1 photo WITH credit+ link back, and do NOT copy and paste my instructions! Wait! Don’t forget to enter to win a free jar of Musselman’s Apple Butter, some recipe cards and a matching multi-purpose bowl. 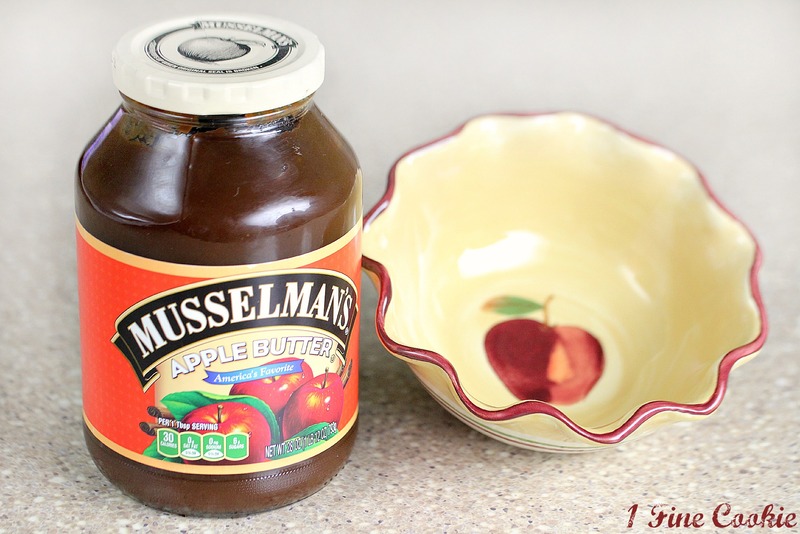 How to enter: leave a comment below saying what type of dish or recipe you would plan on using Musselman’s Apple Butter with. A random comment will be selected for the prize. UPDATE: Entries are officially closed. Congratulations Tiffany! I must say, Pig Licking Cake is possibly one of the best names for a food. Please contact jasmin@1finecookie.com for shipping information. 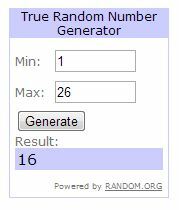 Thank you everyone else for entering! I’d love to use the apple butter either in this pulled pork recipe or in my attempt to replicate the ginger pancakes from The Jailhouse in Moab…best pancakes ever. do you think it would work on the inside of cupcakes?? interesting pondering now…. @Kim, they would taste delicious in a savory cupcake for sure. I need to learn to think outside the box when it comes to cooking and incorporating different things together. Your recipe sounds fabulous! I love apple butter on warm biscuits! I would make a sandwich with white bread and eat it…maybe I’d make more than one. That’s what my Mom used to pack in my lunch back in the day…I love it! That pulled pork recipe looks tasty, I think I would start with that. I always enjoy apple butter on toast. This pulled pork looks and sounds amazing. That would be the first thing I made with the apple butter. Your recipe looks and sounds delicious – it’s the first thing I would try if a jar of Musselmans arrives in my mail (after I toast an english muffin and eat it with a nice slather of apple butter on top). Wait – maybe I would make pumpkin bacon waffles with apple butter on top. Or…never mind, the list is endless and I’m kinda drooling a bit now. Thanks for a chance to win! That pulled pork looks scrumptious!!! I love apple butter. I really want to try this recipe very soon. Thanks so much for sharing! These look fabulous! The first thing I thought of: applesauce spice cake, with apple butter instead. Been ages since I made any! And I can practically smell it now. Guess what I’ll be making this weekend. Thanks for the giveaway. I was introduced to an apple and peanut butter sugar cookie pizza the other day. I’d like to try another version of it using the apple butter as the base, and apples, walnuts and goat cheese as the topping. Yum!! I like to use stuff like that in baking. We like what’s called Pig Licking Cake. I would replace the oil needed with the apple butter instead. apple butter pumpkin pie sounds great! The puule pork recipe – looks yummy! I’d use it in a crockpot recipe with chicken. I would like it in my coffee cake that I bake. I use apple butter to make palacsinta, Hungarian crepes. I also use it in baked apple pancakes, on chicken, and pork tenderloin. I really want to try it in my pulled pork too.